Tomorrow (July 5th) is my dad's birthday (Dad: if you're reading this in the morning before I have a chance to call: happy birthday!). But it is also the Kid's Parade in Shippan Point - a neighborhood in Stamford I've been calling home for the past nine years. The meeting place is at the northern intersection of Ocean Drive West and Stamford Avenue at 11:00am. Kids are encouraged to decorate bikes, wagons, scooters and strollers, and they'll be able to ride in the streets having fun. I can't go to that event, so instead I rode around Shippan Point this morning. It was nice as I got to check out houses I haven't seen before, see Governor Dannel Malloy's old home on Ocean Drive East (beautiful but certainly not anything I'd make an attack ad out of), wonder if my wife and I would ever trade up to one of the bigger houses one day, and say hello to the joggers and dog walkers. And I noticed something several times and in several places. You've noticed them too. Sometimes they are accompanied by signs that say 'drive like your kids lived here', and sometimes not. Sometimes they bear the word 'slow.' They sometimes hold flags. Some of them are yellow or even some other color. There's one right near my house that appears and disappears often. Sometimes I get creeped out by the fact I've never seen it in motion. Cars traveling fast encourage the purchase of Little Green Men. Fast cars also discourage people from getting on a bike and using one for their everyday life. This puts more cars on the roads and leads to more Little Green Men and even fewer cyclists. It's one of those vicious cycle-type deals. 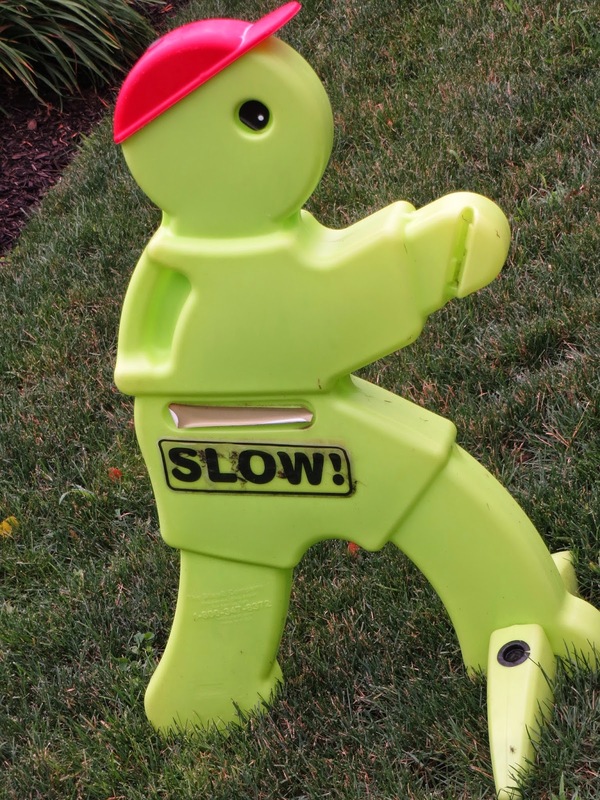 I try to tell people there are ways to get people to drive slower that don't involve Little Green Men - or would at least curb their deployment. Complete Streets initiatives, which include making lanes narrower - from 12 feet wide to 11 feet wide - make people drive a little slower. Bike lanes would help a lot too, since they'd encourage people to ride and make the car travel lanes narrower. But right now, there are no bike lanes, shared road markings, or even a share-the-road sign anywhere in Shippan Point. Tomorrow, kids of all ages are going to be riding and rolling in the Kids Parade. I've been to one here before and also in Southport. The kids will be smiling and laughing. Parents are going to be happy too. They''ll ride and walk down the road and will be safe, and a fun time will be had by all. All I can think to ask is: don't you want yourself and your kids to feel that way all the time? I hope the adults who ride and walk in the parade empower themselves and their kids to ride more when their isn't a parade involved. I also hope that when the adults get back in their cars, they ease up on the gas pedal and use the car less - and start demanding bike infrastructure for the city to make it easier to do both of those things. 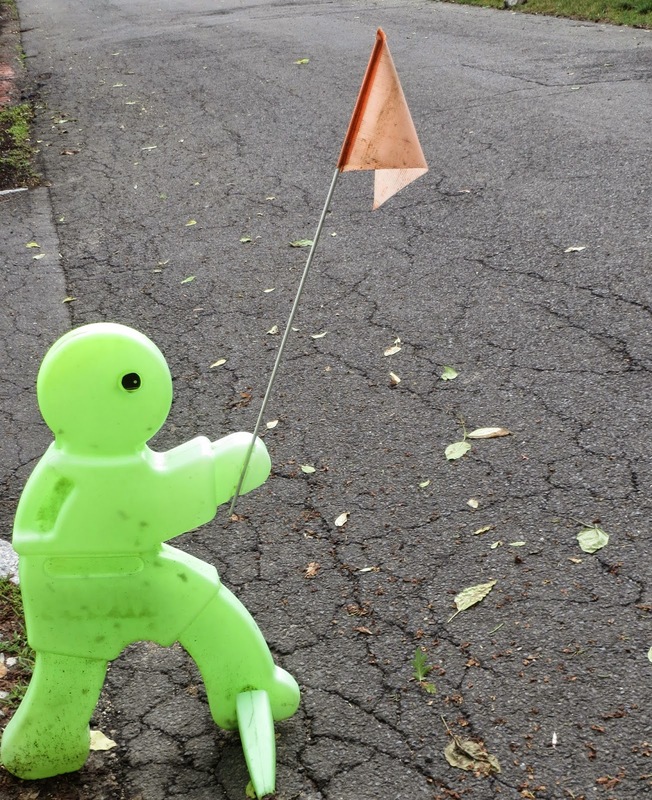 Buying Little Green Men is only one step to make a neighborhood safer. Let's aim for a world where we don't need them. Happy Independence Day. Thanks for reading and thanks for riding.